Another year goes by swiftly and the Jazz Jousters find themselves at the fourth anniversary, and in usual tradition they have put together a nice project to mark this occasion. 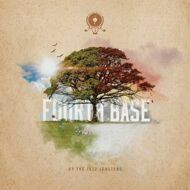 The "Fourth Base" album was originally planned as a vinyl album but it's a little too soon after the recent release of the "Endurance" 12inch which was the first part of this anniversary's goal. Instead they recorded "Fourth Base" to cassette tape. So get your tape deck ready.